NCMA Sprint Cars, and the Mini Cups. With the Season going off into turn three and the Points Battles on fire, if you do not enjoy this time of year, you simply do not have the racing desire. In the Western Late Model Division, the Season continues to roll along with Chad Holman coming into this night 42 Points ahead of Michael Sandoval. On this particular night, the Points Battle heated up on the racing surface as the summer sun gnawed on the short end of a wishbone. And, after the horizon conquered the sun, Lodi’s Michael Wendt (2) rose to the top and conquered all. This one got underway with Tim Spurgeon (86) of Danville, fresh back from back surgery, and Modesto’s Mike Beeler (6) pacing the field to green. Spurgeon jumped out early and brought with him the #05 of Tracy’s Justin Philpott, and over the next forty laps these two would wage a war for the ages as Philpott gnawed and nibbled and bit and chewed at Spurgeon’s back bumper until lap 46 when coming up off turn four, and after fighting a loose-off car all night, the tail end of Spurgeon’s car jumped out from underneath him and he went careening into the oncoming Philpott as they made contact down the front-stretch which was disastrous for the young Philpott by ending his night, and, at the same time, sent Spurgeon to the tail-end of the field. A war of words broke out in the infield and, of course, cooler heads didn’t prevail, but the race got back underway just the same. On the single-file restart, Beeler inherited the lead, but instantly encountered severe pressure from Wendt, which was nothing new on this night since these two had been battling ferociously all race long. The last four laps were outstanding as the two swapped spots several times each lap until on the final lap coming off four to the checkers, Wendt got the advantage, but Beeler fought back in the high groove only to come up about a foot short at the checkers in what was an absolutely dynamic finish on all counts. “All four cars up front were so close the only way anyone was going to pass was by rubbing doors,” the well-mannered Wendt said of the Spurgeon/Philpott incident, then added, “They gave it a shot, but it didn’t work out for them. I was happy to get my second win of the year.” Of course, Beeler had to settle for what seemed to be a very satisfying second. Points Leader Chad Holman (9) of Manteca, after fighting an ill-handling car in the later stages of the race, and after having Modesto’s Jeff Belletto (12) glued to him the entire fifty laps, managed a podium finish in what was an extremely close third while Belletto finished as he started, welded to Holman’s bumper as he crossed the finish line in fourth. Ripon’s Michael Sandoval (17), another rookie having a great year, rounded out the top five. The Street Stock Division roared back into action as they always do: full of emotion and desire. Points Leader Sammy Solari (79) of Escalon claimed victory on this evening starting P3 on the grid. This one got up and going with Robert Daniel (17) of Lodi and Modesto’s Garland Tyler (73) showing the field the way to greet the green. Daniel grabbed the holeshot along with a huge hunk of forward bite as he sailed off to a full straightaway lead where he looked remarkably healthy out front with absolutely no challengers until lap 28 when Mark Squadrito (3) of Livermore and the #5 of Stockton’s Rich Harper got together coming off turn four which brought with it the first yellow on the night. Unfortunately, that was one yellow Daniel was hoping against hope, wouldn’t come because the lap 28 restart put Solari to the outside and when the green flag fell, Solari got the jump and was gone, at least until lap 33 when Tyler and Ben Lewis II (22) of Stockton made contact coming low out of four which resulted in the second yellow of the race. On the lap 33 restart, Solari picked her up where he left off all the way through to the checkers to capture his eighth win on the year. “Robert Daniel is really running good, he’s a good competitor, he ran me clean, he was real great to run with tonight,” said the unusually subdued Solari, but then added with his usual confidence, “Some guys out here are worried too much about points and right now I’m not worried about points, I’m worried about winning the rest of the races this Season.” Daniel, by all accounts a wonderful surprise this year, finished another solid run in second with the stealthy Squadrito finishing on the podium in third. “Racin” Jason Aguirre (45) of Atwater, although he seemed to be dealing with an evil race car all day, still managed a fourth while Aaron Coonfield (25) of Riverbank, in his first appearance of the year, brought her home in fifth. The Bombers declare the closest Points Race in all Divisions with a mere 2 Points separating Travis Tucker and Robbie Knittel. Tonight would be proving grounds for both drivers, and Points Leader Tucker (350) of Stockton proved the strongest in this race. The Speedway has been mixing it up for this Division and tonight was no different as they added a chicane to the back-stretch. Stockton’s Tom Dahl (004) started on pole with Tucker alongside, and as the green flag went flying, Dahl jetted out to the early lead only to spin coming off turn four which relegated him to the tail-end of the longest line and presented him with a long night to come. On the single-file restart, after inheriting the top spot due to Dahl’s misfortune, Tucker took off and made it look easy as he continued to yard the field through four caution periods and some craziness with one car driving backwards at one point. When Tucker finally crossed the stripe for his first-ever win, he found himself in another zip code compared to the rest of the field as he was well over a half-lap in front of his nearest competitor who happened to be the #043 of Stockton’s Andy Rumsey in what was his best finish of the year in second. Fast Freddy Rathjen Jr. (290) of Stockton, driving his dad’s car, finished on the podium in third with Dahl, after what one might consider a mysterious night, managed to make it back up to finish fourth, no small fete in itself. Lodi’s bright young star, Robbie Knittel (003), made up the final spot in the top five. During post-race tech, Rathjen’s car was deemed confusing to the technical instruments and was sequestered until Monday morning for further testing. So, at the time of this Release, the Bomber results were not official. The Mini Cups’ Chase is not as of yet a foregone conclusion, but with Jared Cronk missing a race this year, Travis Affonso holds the upper hand. 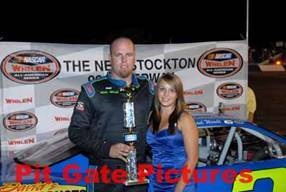 Unfortunately, both drivers missed this event, and the winner tonight would be Stockton’s own Cody Johnston (50). Johnston led from the gun and crossed beneath the checkers for his first-ever Main Event Win, which boosted him up the Point Standings to Second. Landon Reynolds (57) of Manteca, after mechanical woes last time out, finished up in the second position. The NCMA Sprints are such a great Division to watch as they explode across the start/finish line into an exhibition of stunning talent and speed. And, the #3 of Napa’s David Goodwill proved to be too much to handle on this night. These drivers roll to the green flag at such a high rate of speed the fans in the stands can’t help but feel the acceleration as they scream by. The #6 of Denny Burrell led the field past the over 800 in attendance to get this one rolling with Stockton’s Bill Logan (98) at his right-side door. Burrell jumped out early and appeared strong until lap 10 when he had no choice but to surrender the lead to Goodwill coming down the back-shute, where, once there, Goodwill took complete control, but not without a very aggressive, seventy-two-year old, Ed Amador (76) of Modesto, all over him for the next twenty laps until lap 30 when Goodwill began to inch away to a four car-length lead as he crossed below the checkers for his third win of the year at Stockton. Amador, try as might, could never overcome the power of Goodwill and had to settle for a second place finish. Morgan Hill’s Rob Hammond (17H), always strong at Stockton, finished on the podium once again in third. After showing his strength early on, Burrell fell off the pace a bit, but still managed to finish fourth with David Burchet (77B) of Tracy rounding out the top five. Next Saturday, August 14th, NASCAR Whelen All American Racing Series returns on Kids Night with the Western Late Models, Grand American Modifieds, 360 Vintage Modifieds, Bombers, Basically-4-Cylinders, Legends of the Pacific, Bandoleros, Figure 8 Racing and the Mini Cups. All this action will be Presented by Ghirardelli and Stockton Food for Less. Along with Kids Night, Stockton 99 Speedway is honoring one of its Legendary Greats: Johnny Brazil on Johnny Brazil Night at the Speedway.